I really didn't enjoy Downwell. After hearing many good things about it I've decided to give it a look, but a few hours in and I couldn't play it anymore. I recognize that it's a well-made thing, but I'm not enjoying it at all, and I think that to make it a fun game, a few things would've been required for this arcade experience to really shine. The core concept of Downwell is that you go down a well by jumping on enemies and shooting them with your gun boots. The game breaks down at its core idea for me; It controls really badly, you take damage if you jump on some enemies, you take damage if you hit enemies at a certain angle, it's imprecise to move left and right while shooting and since you're falling down, you don't see what's in front of you. I kept taking damage to dumb things over and over, trying to see what's ahead doesn't work and everything looks too same-ish for me, so it happened that even figuring out which enemies were okay to jump on and which were not was an issue. 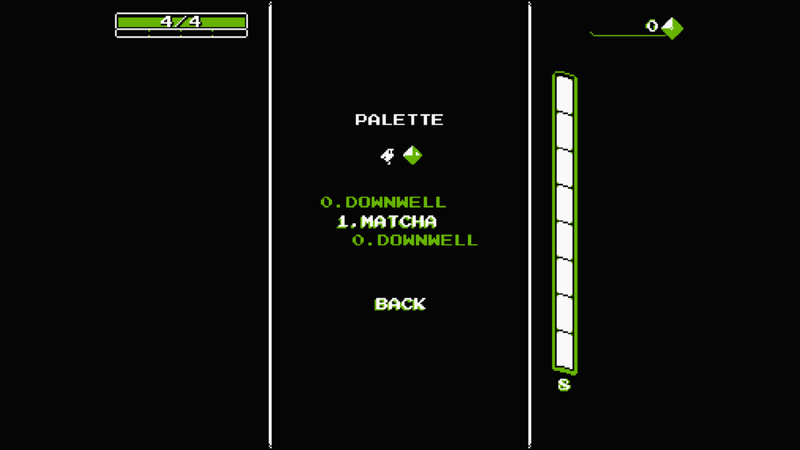 By killing enemies, destroying chests and rocks, you find gems they're used to unlock new color palettes for the game which is a terrible upgrade in a game that badly needed unlockable powerups. Give me permanent health boosts, more energy to use my gun, special abilities that I can upgrade from run to run. Instead you have a choice of abilities after you complete a level, they're chosen from a random pool, most of them feel useless. You can also buy temporary upgrades at random shops, but they just last for the current run so if you're dying constantly, they're not a good investment. You also get random guns from certain power-ups, it's tough to know which one is better since nothing has stats on it. Downwell is quite stylish, but it controls badly, you have to go on faith, the upgrades are not rewarding and they're so ephemeral that they feel inconsequential. I tried playing it enough to get better at it, but never could, really. I stopped after about three hours.